The life of a missionary and hospitality go naturally hand in hand. We often find ourselves both in the giving and the receiving end. I think of our times on furlough when members of various churches around the country host us for a meal or over several nights in their home. We may be strangers as we pull into their driveway, but we leave as friends with these brothers and sisters in Christ. I also think of the national church members who have taken considerable time and energy to host us, and also show us how to set up and live life in a new place. We started over twice in a new country-once in Mexico and once again in Uruguay. Both times we were needy and on the receiving end of much Christian love and care. 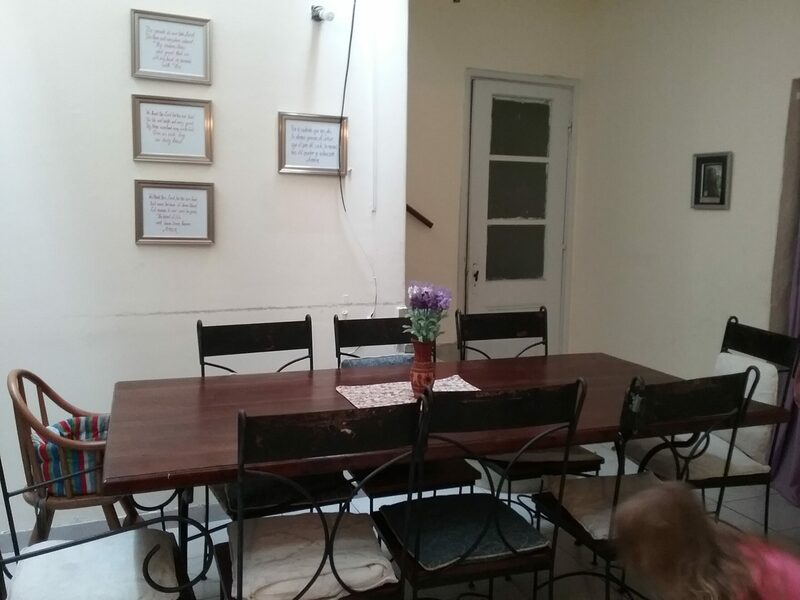 Our dining room table, where we host many guests. We also have the honor of being on the giving end. Three years ago I prayed that the Lord would give us a house with a guest room here in Uruguay and He answered our prayer. We have had Americans stay with us, short term team mission workers, as well as people involved in our ministry here. Showing hospitality is a blessing. It is also tiring and a good way to be forced to see one’s weaknesses! I have been spending time reading books on hospitality of late, both to recieve inspiration and to learn more about this Biblical practice. 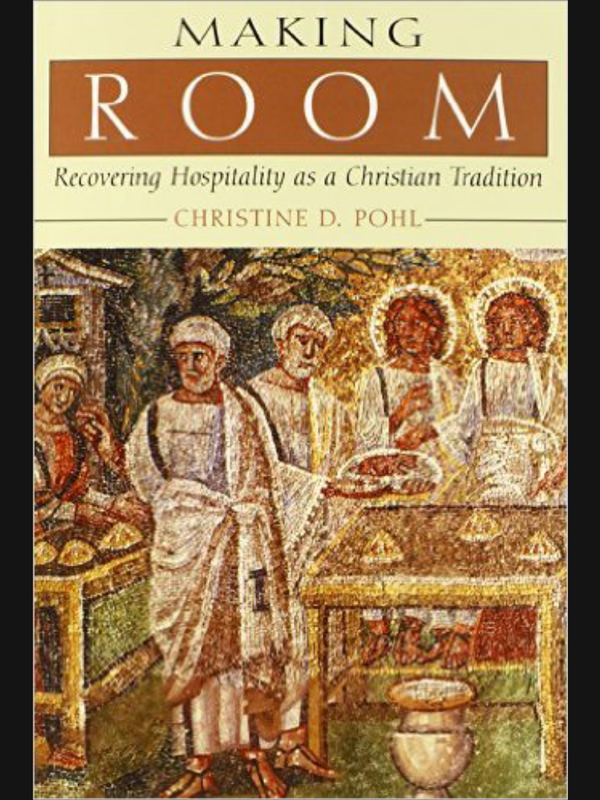 One of best books I have found is called “Making Room: Recovering Hospitality as a Christian Tradition” by Christine D. Pohl. It is an incredibly well researched book that looks at the Old and New Testament teaching on hospitality, and at the practice in the early church, and throughout the history of the Western church. 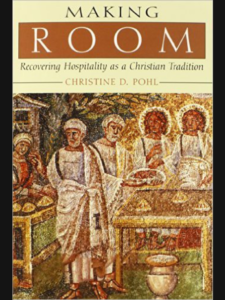 The author shows what a rich tradition we have in Christianity for the practice of hospitality. In the book we learn how hospitality was practiced in the past, what were the difficulties and how they overcame them. We discover that hospitality was one of the key ma5rks of our early religion. The author demonstrates how hospitals, hotels and services for the poor all grew out of that rich tradition, and how these very organzations in turn took over the care of the sick, the traveler and the poor. She takes an honest look at the difficulties of applying these ancient forms of hospitality today, and she tries to get at the heart of what it means to show hospitality in our age. She includes plenty of quotes from key leaders throughout the history of the church as she analyzes the various facets of hospitality. I think this is strongest part of the book. We are not merely hearing the insights of the author about hospitality, but instead we have the opportunity to glean wisdom from last two milenia of Christianity. The Scriptures come alive as we see how they are applied, not only in our time, but in ages past. The author has also spent time researching eight modern ministries whose focus is on hospitality. These ministries could be seen as being engaged in “extreme hospitality”–those on the frontline of living alongside the homeless, or the disabled, or refugees. She interweaves their stories, experiences and wisdom throughout. For me this has been one of those books that has left me changed and enriched. I especially appreciated the section on accepting one’s limitations in hospitality. It was good to hear even church fathers and practitioners of extreme hospitality teaching about the importance of accepting that we are finite, as this is something I have been learning in my own life. I won’t lie, the book can be overwhelming at times. She does not soften the commands nor whitewash the nature of the task. But she also readily shares the realities that neither an individual, or even a church, can expect to do what these hospitality ministries accomplish. The needs are great and it takes the whole body of Christ to meet them. Where this book is the weakest is in helping the individual Christian or small church figure out how to incorporate hospitality into their real lives. She shares many ideas, on the more philosophical level, of restoring a culture of hospitality, but leaves the practical application for others to develop. What experiences do you have being on the giving or receiving end of hospitality? Have you read any books on the topic that you would recommend? Helio Mrs Call, thank you for the review. I have a recommendation from the other side of the doctrine spectrum, a straight-forward and simple, but yearning, book on hospitality that i think Christians can see godly benefits and blessings. The book is Sarah Smiley’s “Dinner With the Smiley’s.” If you haven’t access to a copy, please let me know! Thank you for the recommendation! I looked it uo on Amazon Kindle and they have it. I look forward to reading it.